The weather is definitely still hot enough for an ice cream social so here are a couple of different ways to incorporate ice cream cones into your decorations. Tiny Belles Boutique hosted an adorable Ice Cream Social. She made tissue poms and tied them to waffle cones. They were hanging in the tress for a great accent to the party! Here is a great idea from Martha Stewart’s Craft Depart. They made paper cones and added balloons on top to make the ice cream. Here is a great ice cream cone pinata that kids are sure to enjoy! Here are some more great centerpieces using balloons. 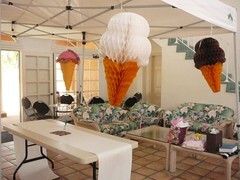 Living Eventfully had a great ice cream party. 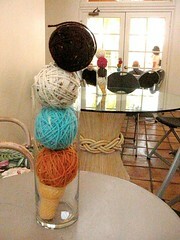 She rolled yarn into balls and placed them with a real ice cream cone in a cylinder vase. 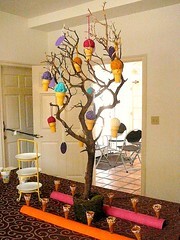 She also had an ice cream cone tree using yarn balls secured into the cone. I love the idea of using small boas to make these ice cream cones found on Hostess With the Mostess. I Love the first photo with the cones and tissue poms!! How clever.